In the meantime I'll practice on less honorable throats..."
Hi, my name is David, and I'm a Sweeney-holic. I remember my first taste of Stephen Sondheim's intoxicating, highly addictive musical brew. It was 1979, and I was only 16, a mere babe in the Broadway jungle, when I innocently happened upon this lyrical thriller about a vengeful London barber who slits the throats of his unwitting clients, then grinds up their remains and stuffs them into meat pies made by his partner in crime, Mrs. Lovett. The macabre story coupled with a soaring score featuring such instant classics as Pretty Women, Not While I'm Around, and A Little Priest captured my imagination like no other show before it. When the curtain came down, I was giddy, and couldn't wait to go back and recapture the experience. To get my fix, I'd scrimp and save until I had enough money for another ticket, then rush to the theater and revel in the sublime music while Sweeney's razor released rivers of blood. My friends, bless them, tried to save me, but all the alcohol and marijuana they offered me could never match the exhilarating high of Sweeney Todd. I wandered down the dark path alone, and there was no turning back. Sweeney had enslaved me, and I couldn't escape its powerful grip. And the most horrific part of it all was that I didn't want to. I saw the Broadway original with Angela Lansbury and Len Cariou four times. When Lansbury took the show on tour with George Hearn (read the dOc review of the DVD here�guess who wrote it), I caught a performance in Chicago. I also took in a New York City Opera production in 1987, and accompanied my daughter (I know, I know, shame on me for corrupting her!) to the innovative 2006 Broadway revival with Patti LuPone and Michael Cerveris. And I've seen Tim Burton's breathtaking 2007 film adaptation starring Johnny Depp and Helena Bonham Carter three times�once in the theater, once on DVD, and now, best of all, on Blu-ray disc. Billed as "A Musical Thriller," Sweeney Todd was the first (and probably only) Broadway musical to perch patrons on the edge of their pricey seats, jolt them with frightening effects, and gleefully rack up a body count higher than any teen slasher flick. Satire and wit temper the grisly doings considerably, and Sondheim's gorgeous melodies soothe the senses, but the shocking elements of Sweeney prevail. In the film version, Burton ups the ante, further darkening the mood, heightening tension, and wallowing in violence and gore. The result is a masterful musical horror movie that's not for the faint of heart or weak of stomach. Broadway aficionados beware: This is not Angela Lansbury's Sweeney Todd�but it's no less thrilling or compelling. With a washed out palette and impeccable sets and costumes, Burton immerses us in the grime, greed, corruption, and immorality of late 19th century London. Dour characters with hollow eyes slink across the screen and talk in hushed, conspiratorial tones. Even the ing�nues�the idealistic sailor, Anthony (Jamie Campbell Bower), and his captive love, Johanna (Jayne Wisener)�look beaten down by their oppressive society and take little joy in their burgeoning romance. Natural acting enhances realism, as do the graphically gruesome murders; Burton captures Sweeney's butchery in close-up, and seems to relish the spurting blood and thud of limp, lifeless bodies after they cascade headfirst down a two-story trapdoor chute and crash against the cement floor in Mrs. Lovett's bake house. The ghoulish humor that pervades Sondheim's original remains, but it's muted, as if Burton is worried too much wit will dampen the dire doings. Sweeney purists will fault the director (and Sondheim, who was integrally involved in the production) for excising and truncating parts of the score, but such cuts, though deeply disappointing, are necessary to maintain dramatic tension and narrative flow. Gone is the recurring (and highly theatrical) Ballad of Sweeney Todd and exhilarating quartet, Kiss Me, but both pieces lack the intimacy that's such a central element of Burton's presentation. The absence of any large-scale production numbers keeps the focus on the characters, though Burton employs many innovative techniques to make the songs visually interesting. And seeing the actors sing in close-up allows us to savor critical nuances often lost on stage. When Sweeney Todd was first announced with Depp and Carter�two non-singers�in the leading roles, I had grave misgivings. Could they tackle the demanding score? Would Depp camp up Sweeney � la Jack Sparrow? Could the demure Carter channel the broadly drawn Nelly Lovett without sparking comparisons to Lansbury? And would Burton's nepotistic casting (he's best buddies with Depp and Carter's bedmate) ultimately sabotage the whole show? Before panicking too much, I reminded myself I harbored similar doubts when Ren�e Zellweger, Catherine Zeta-Jones, and Richard Gere were cast in Chicago, and all three knocked my socks off. I could only hope the stars of Sweeney would do the same. And, largely, they do. As the brooding, angst-ridden title character, Depp once again vanishes inside his role, crafting an intense portrait of a tortured man consumed by revenge. His target is the lascivious, corrupt Judge Turpin (played with delicious menace by Alan Rickman), who 15 years prior banished him to an Australian penal colony on a trumped up charge so he could sexually prey upon his na�ve young wife. Turpin is now the guardian of Sweeney's grown daughter, Johanna�and lusts after her as well�and while the crazed barber lies in wait for the judge to patronize his "tonsorial parlor" on Fleet Street, he wages a bloody one-man war against the society that wronged him. We all know Depp can act, but can he sing? The answer is yes, and he sails through the rigorous songs with aplomb. His voice may be thin, but Depp often produces lush, silky tones that beautifully caress Sondheim's melodies. In a Broadway theater, he might not be heard past the third row, but on screen his vocals possess enough power to amply depict Sweeney's seething rage. Carter wisely steers clear of a Lansbury imitation, choosing instead to make Mrs. Lovett more blatantly cunning and sinister, yet without shedding her maternal attitude. The low-key approach works well during dialogue scenes, but Carter's wispy vocals and lethargic delivery often take the sting out of the black humor and inspired word play that permeate Sondheim's brilliant lyrics. Still, Carter's bold interpretation adds a fresh twist to the musical, challenging long-time fans to look at it in a different way. Though I will always prefer the Broadway original, I'm no Sweeney snob, and am happy (and relieved) to report the film version continues to fuel my incurable addiction to this musical tour de force. Sure, Burton embraces the show's darkest aspects and bathes it in more blood than ever before, but he keeps a tight grip on both the powerful emotions that propel the unsettling story and the themes that make it resonate. This literal man-eat-man tale is certainly not everyone's cup of tea, but for those who can appreciate the material, this Sweeney, like Mrs. Lovett's savory meat pies, is one delectable dish. Image Transfer Review: Sweeney Todd was announced for HD-DVD last winter, but the format's demise quashed its release, so fans have been forced to endure an interminable wait for this high-def rendering. Luckily, DreamWorks rewards our patience, fashioning a surprisingly lush 1080p transfer that captures the film's mood, atmosphere, and brutality. Gray, muted tones predominate, and aptly reflect the bleak, industrial setting, but splashes of intense color perk up flashbacks and fantasy sequences. The transfer handles these abrupt transitions well, with finely pitched contrast and no bleeding (except when Sweeney slashes throats�sorry, couldn't resist). Details are vivid, and the many dark sequences never look muddy. Close-ups crackle with clarity, and no evidence of dreaded DNR could be detected. Audio Transfer Review: An operatic musical like Sweeney Todd cries out for top-notch audio, and the 5.1 Dolby TrueHD track nicely fills the bill, providing immersive, richly satisfying sound. Song vocals are crisp and prominent, so the all-important lyrics can be understood, and though bits of the often mumbled dialogue get lost, most conversations are clear and well balanced. Subtle ambient accents are distinct, and more bombastic elements resist distortion. Best of all, Sondheim's gorgeous orchestrations shine like never before, possessing incredible tonal depth and fidelity. The sheer joy of hearing such fine music spread across the full spectrum of speakers is a stirring experience that pumps up the story's emotional intensity and draws us further into the film. Extras Review: Sweeney Todd carts over all the extras from the two-disc standard def DVD, but presents them in full 1080p�another reason fans should strongly consider an upgrade. First up, the 26-minute Burton + Depp + Carter = Todd chronicles the contributions of the film's director and two main stars through interviews and on-set footage. Burton talks about his 20-year fascination with Sweeney Todd, while Carter confesses that she has wanted to play Mrs. Lovett since she was 11, and Depp discusses his close collaboration with Burton. Sweeney Todd Press Conference runs almost 20 minutes and is a lively panel discussion during which the cast and director craft insightful observations and fling caustic barbs. Also 20 minutes, Sweeney Todd Is Alive: The Real History of the Demon Barber debates whether "the greatest mass murderer in the history of English crime stories" actually existed. A number of well-heeled, intellectual experts weigh in on the topic, as they discuss cannibalism, the origins upon which Sweeney's legend might be based, and the violent proclivities of Victorian England. The absorbing featurette also examines the character's theatrical and cinematic roots, and his effect on the public then and now. Equally fascinating, Musical Mayhem: Sondheim's Sweeney Todd, which runs 12 minutes, looks at the composer's attraction to the project and its unlikely transformation from horror story to musical. Sondheim discusses how he uses music to keep the audience in suspense, the "pleasures and dangers of revenge," and how he purposely sought to refashion the stage show for the screen. The 16-minute featurette Sweeney's London provides a look at the overcrowded, industrial squalor that spawned Sweeney Todd in 18th-century England, as well as the real-life atmosphere of Fleet Street and the grisly origin of the red-and-white twirling barber pole that graces many shops to this day. 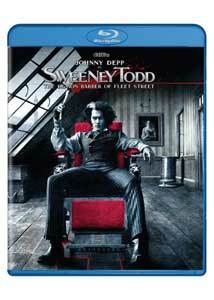 More mainstream, The Making of Sweeney Todd is a slick, 24-minute behind-the-scenes documentary, with sequences on the cast, Burton's vision, Sondheim's music, costume design, and production values, while Grand Guignol: A Theatrical History tracks the development of a specific type of tragic melodrama that combines horror with humor. The 19-minute piece also discusses the genre's themes and how they influenced Hollywood during its golden age; salutes a contemporary theatrical troupe that produces original Grand Guignol plays; and spotlights a famous Parisian theater where the form flourished. Designs for a Demon Barber runs nine minutes and delves further into the film's costume, production, and set designs and its de-saturated look. Also nine minutes, A Bloody Business dissects the movie's gruesome murders and how the crew pushed "the boundaries to the slightly ludicrous." All the secrets�dummies, prosthetics, blood pumps�are divulged in this ghoulishly entertaining featurette. The 11-minute Moviefone Unscripted with Tim Burton and Johnny Depp finds the director and actor answering a wide range of lame viewer questions in a relaxed, jovial manner, and The Razor's Refrain is an eight-and-a-half-minute medley of songs from the film set against a selection of striking color stills. A photo gallery featuring 52 color images, including set and costume sketches, studio portraits, and behind-the-scenes candids, and the original theatrical trailer complete the extras package. Sweeney Todd: The Demon Barber of Fleet Street makes a solid transition to the screen, thanks to Tim Burton's dark, bold interpretation, which allows us to view Stephen Sondheim's musical masterpiece in a thrilling new way. If you can stomach the subject matter and violence, you'll be rewarded with a compelling narrative, glorious score, and first-rate performances by an accomplished cast. The excellent video and audio transfers and fine spate of supplements make this a must-own Blu-ray for both musical and horror aficionados alike. Highly recommended.